Multi-function program simulating the 50g's date functions DDAYS and Date+ (HP Prime = DPLUS). In addition there are further functions like JDN, N2J, DOW, CALD, DOE. DFX functions are designed to be called from both the CAS and HOME environments, including the ability to choose them with softkeys. 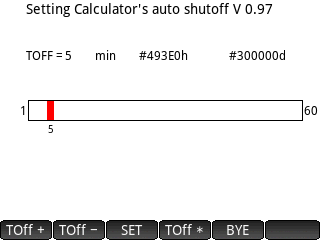 A program to make it easy to set the auto shutoff period, using a slider. Also includes a slightly newer version without the slider.